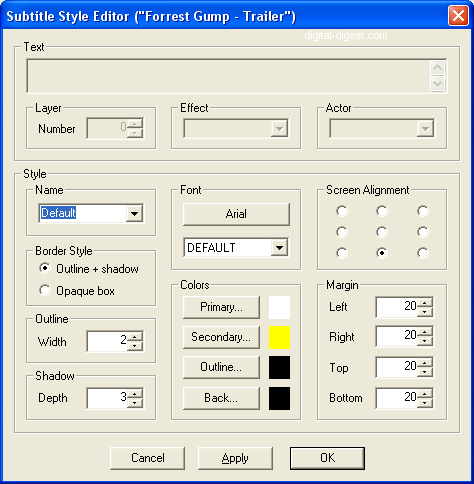 This section shows you how to turn subtitle files (eg. *.sub, *.srt, *.ssa ...) into hard-coded subtiltes that are burnt into the AVI file, using VirtualDub and the TextSub plug-in. The advantage of doing this over having a separate subtitle file is that this allows subtitles to be displayed when the player (software or hardware) does not support subtitles. The disadvantage, of course, is that subtitles can't be turned off and you will need to re-encode the video. Before we get started, please note that while some basic instructions will be covered, it is recommended that you know about DivX/XviD encoding. Start VirtualDub and load in your AVI file. From the "Video" menu, select "Filters". In the window that opens, press the "Add" button and select the "TextSub 2.x" filter, press "OK" to load the filter. A new window should open. You can configure the word-wrapping style, but the default selection (\q0) should be fine. Use the "Open" button to load in your subtitle file, and then click on the "Styles" button to open a new window where you can configure the style of the subtitle display. The style options are all fairly obvious, but if you need more help, this short guide will explain all the options. You can make changes here and then preview these changes by closing the filter windows to go back to the main VirtualDub screen, and using the output preview display (the right hand side of the two video displays - the left hand side one is the original/input video preview - you can resize the left hand side so you can see the output preview in full). You might need to use the seek slider to move the video around a bit before you can see the changes. To make more changes, from the "Video" menu, select "Filters" (this should show a list of filters you've applied to the video), select the "TextSub" filter and press the "Configure" button (and then the "Styles" button to change the styles). Once you are happy with the subtitles, we will now need to re-encode the video to include the burnt in subtitles. As mentioned before, this guide will not cover the video re-encoding instructions, but you can read a quick reminder of how it's done here in our VirtualDub: Two Pass Encoding short guide.